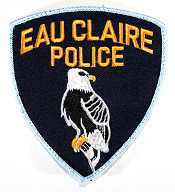 This plan has been prepared as a cooperative effort between the residents of the Eastside Hill Neighborhood and the City of Eau Claire in an effort to identify issues facing the neighborhood and develop a means to resolve these problems. 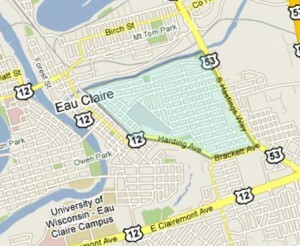 It serves as an element of Comprehensive Plan, which was adopted by the City of Eau Claire in September of 2005. The Comprehensive Plan stresses the importance of neighborhood planning and the need for stable neighborhoods as building blocks for the City. 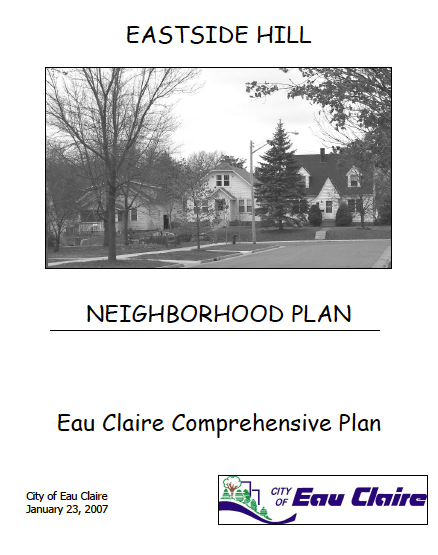 One of the primary objectives contained in the plan states, “The City should maintain or revive the traditional urban character of the older neighborhoods so that they remain attractive places to live.” This emphasis is outlined in both the Land Use and Physical Character Chapters of the Plan. The primary purpose of developing this plan as well as other neighborhood plans is to take an in depth look at issues facing the neighborhood and develop a realistic and shared vision to strive for. Once adopted, this plan should serve as a guide for public agencies, residents, property owners and others concerning the planning and implementation of public and private investments for the neighborhood. The scope of such a plan is a ten to fifteen year timeframe and should be re-evaluated on a period basis.